The other day during my stay in Santa Fe, I stumbled upon Max Cole. She’s a minimalist artist, originally from Kansas, whose work was being shown in tandem with the work of Constance Dejong at Charlotte Jackson Fine Arts. 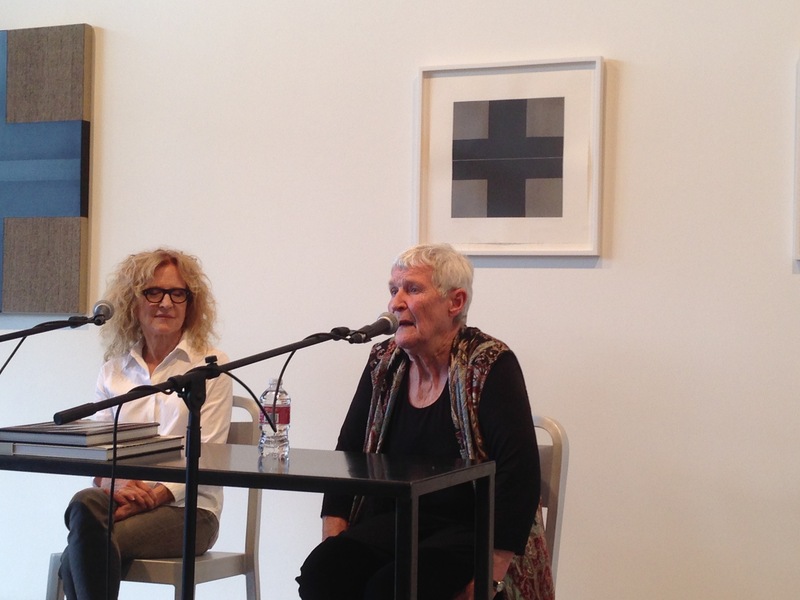 When I entered the gallery I had no idea that I was just in time for a talk by the two women. I stayed for it, luckily getting a front row seat. And as I left the gallery, I found myself crying because I was so moved by their work. 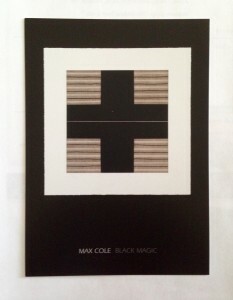 I took notes on their talks, and I want to write about Max Cole here. Max Cole in her late 70s and has cropped, no-fuss gray hair which seems to convey that she’s not at all concerned about impressing people. She’s nearly deaf and frequently apologies for perhaps misunderstanding questions. 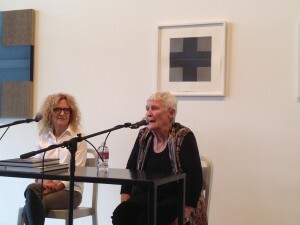 Cole got her MFA at University of Arizona, Tucson; then spent twelve years mostly in solitude in Los Angeles; and in the 1970s, she was in LACMA’s New Abstract Paintings exhibit. Subsequently, she lived in New York City; Woodstock, NY; and then went back to California, where she lives now. She works in white, gray, and black. Renoir, she says, declared that “black is the queen of color.” Very early on in her art career, she eliminated color in her work because of its psychological associations, she tells us: she not interested in emotions. 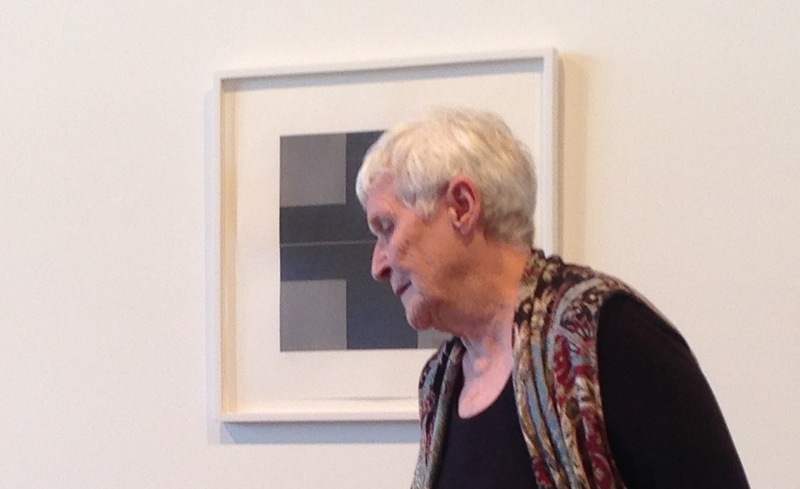 What she honors is the “golden rectangle.” And in this show, the Greek Cross. For me, Max Cole’s work that evokes the holy. Following the ideas of Kazimir Malevich, she holds that mysticism is the basis of her art. It “articulates a field of energy outside the traditional concepts of design….Spirituality,” she says, “requires the setting aside of ego and emotion, which are superficial aspects” of the human being. Instead it is only a sense of humility that allows one to approach infinity. But why and how that works in her work baffles me. Is that because of the perfect equilibrium of the square? or the exactitude and perfection of each line? or the complexity when captures in apparent simplicity? or the use of the cross image (though not the crucifix)? Unfortunately, I did not take any pictures specifically of her work at the show. I felt the gallery wouldn’t like that. So the best I can do is take a picture of announcement card I picked up. The piece is called “Greek Cross Series 3, 2015” with acrylic and acrylic washes on rag paper. Oh, I’d like to own one of her pieces!